A native of Ghana, West Africa, Habiba offers an interactive, multi-cultural performance with authentic West African costume, spiced with singing and movements. Her stories will encourage the audience to explore their own world as well as those far, far away. Addo performs stories from the continent of Africa and its diaspora to inspire and provoke thought. She lives her art through continuous study and practice – combining her knowledge and deep appreciation for these cultures with her natural talent for storytelling and prodigious vocal abilities. Anyone who has witnessed her performances will testify that she blends her sense of humor with extremely genuine respect and love for these revered traditions. Addo teaches and performs with infectious joy and adept technical accuracy. 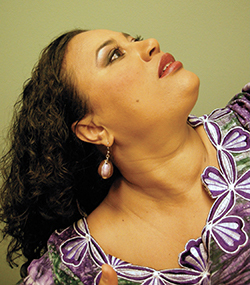 She has performed and taught the local community in dance, storytelling and theater through companies such as Miracle Theater, Northwest Afrikan Ballet and Portland State University.